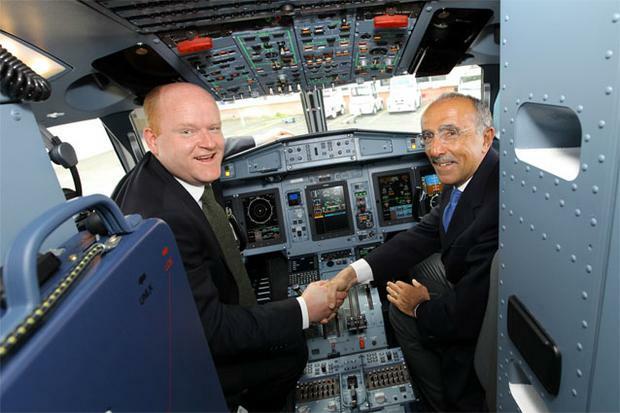 Aer Arann has taken delivery of the first of eight new aircraft it ordered under a €144m deal. The airline – majority owned by UK transport group Stobart and Invesco Asset Management – operates all its flights under the 'Aer Lingus Regional' brand as part of a franchise agreement with the larger carrier. The new aircraft purchase is part of Aer Arann's new strategy that aims to make it one of Europe's top-tier regional airlines. Aer Arann hopes to more than double its annual passenger numbers to two million over the next five years. It ordered the eight aircraft from French manufacturer ATR and yesterday took delivery of the first plane in Toulouse, where ATR is headquartered. The remaining seven new aircraft will be delivered to Aer Arann over the next 11 months. The turbo-prop planes will be used to operate existing key routes from Dublin to destinations such as Manchester and Birmingham. "The arrival of these new planes will enable Aer Arann to further expand our regional offering and to support the addition of new routes and frequencies on existing routes," said Aer Arann interim chief executive Sean Brogan. "We already have plans in place to increase frequencies on our Dublin-Edinburgh and Dublin-Glasgow routes." Aer Lingus and Aer Arann recently agreed a 10-year extension to their franchise agreement. While Aer Lingus chief executive Christoph Mueller has ruled out taking a direct stake in the smaller carrier, Aer Lingus has taken a 33pc equity stake in the company that has been used to acquire the eight ATR aircraft that are in turn leased to Aer Arann. Aer Arann has had a troubled time over the past few years and went into examinership following the volcanic eruption in Iceland that closed swathes of European airspace in 2010. Last year, Stobart approached former Aer Arann chairman Padraig O'Ceidigh about buying out most of his remaining stake in the airline. It had taken an initial stake as part of the plan to exit examinership. It now owns 42pc, as does Invesco. Mr O'Ceidigh retains a 5pc stake but no longer has any direct involvement with Aer Arann. London-based Cenkos Securities is also listed as owning about 10pc of the airline.